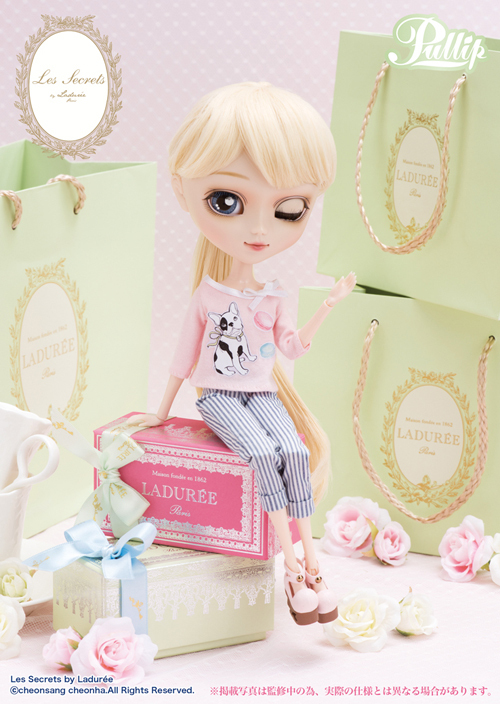 Pullip Les Secrets by Ladurée Announced! For as long as I have been collecting Pullips and should know what to expect, Groove continues to surprise me with all of their different Pullip collaborations, I don’t think I could have honestly forsaw the latest collaboration doll that Groove just announced via their blog. Groove previously posted pictures on their blog of a Pullip in the Ladurée bakery at the time I didn’t really think it that noteworthy, I thought perhaps she was just the shop mascot for that location and Groove thought it was cool so they shared pictures or perhaps they were just teasing a new outfit set that would be released. 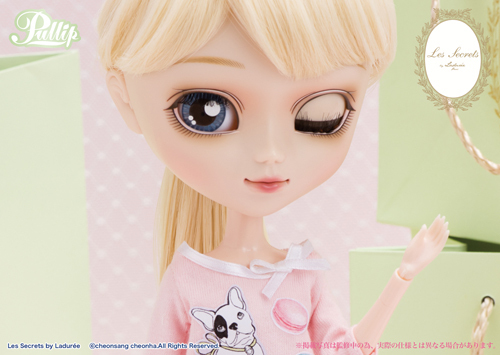 At first glance I mistakenly thought the Pullip was ha-ha or Dahlia Cinderella or one of the other blonde hair/blue eyed dolls that seem to be dominating the release schedule recently I didn’t even realize that it was a doll we hadn’t seen before. Groove officially announced Pullip Les Secrets by Ladurée late last night, she is being released in collaboration with Ladurée. Ladurée is a French luxury bakery that is renowned for their sweets especially their macarons. It was founded in 1862 in Paris, Ladurée locations have since opened around the world including several locations in the United States I will definitely have to check out one of their New York locations next time I am in the city. Pullip Les Secrets by Ladurée is to be released in November, she will be released one month later here in the US hopefully in time for Christmas as she is a little confection I would love to see hiding under my Christmas tree. 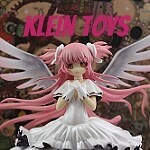 She has a MSRP of 22000 yen which is about $199 as of this writing. 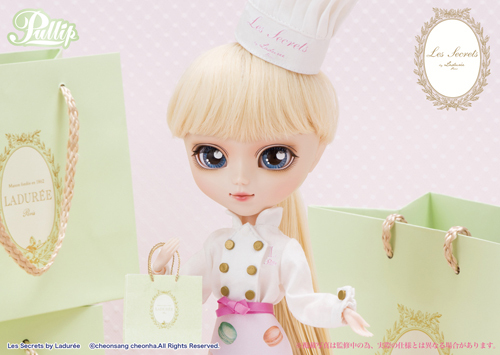 Looking at Ladurée’s website and the pricing for their confections it is not hard to see why they are considered a luxury brand, the Pullip is definitely priced luxuriously as well! 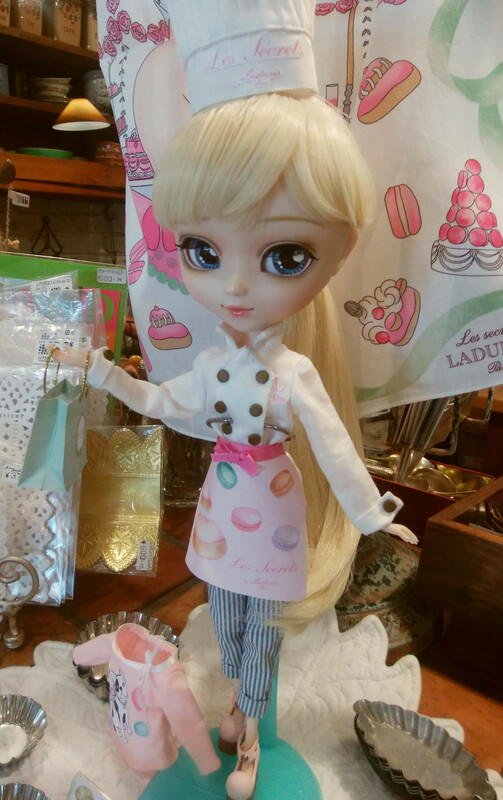 It will be interesting to see if Ladurée themselves will sell the Pullip at all, at their various locations. 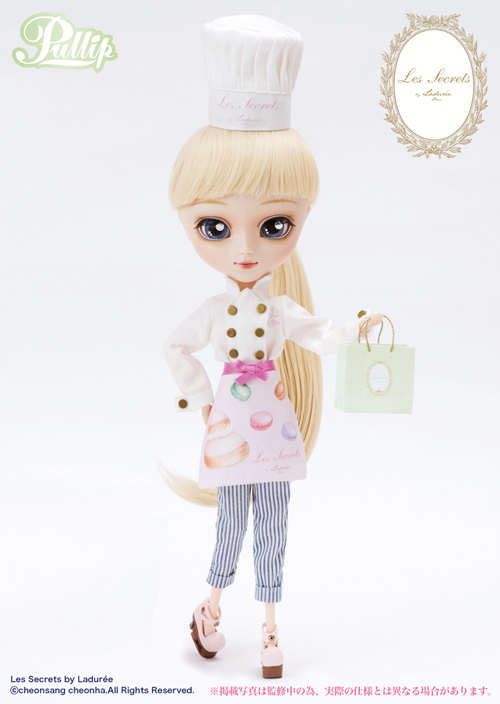 Pullip Les Secrets by Ladurée looks ready for work in her chef coat and hat, she even comes with a cute, decorative apron. The apron features macarons, Ladurée is famous for their very popular double-decker macarons so it quite fitting. While her shoes are very cute, I’m not quite sure they are approved shoe footwear. 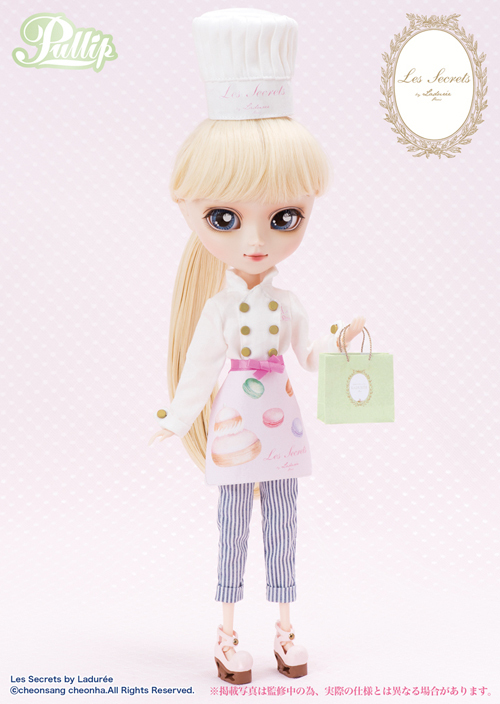 I wish the chef hat was slightly larger to better accomodate Pullip’s larger head size, it looks a tad small to me. Even an accomplished pastry chef like Les Secrets needs a night off every now and then, she comes with a cute shirt featuring a dog (I believe it’s a French bulldog) and macarons. I really like her relaxed look, even when she has a day off of work she looks quite stylish! Les Pullips is one sweet chef! That macaron looks yummy, I want a bite! I have a tremendous amount of respect for chefs, pastry chefs in particular as I watch a lot of cooking shows and always seems almost like science fiction to me as I am not a very good cook it has improved over the years but I have managed to burn water before. I know baking is an exact science and if the ratios are off even in the slightest it doesn’t turn out well so I know Les Secret must be quite the chef! I feel like I would have preferred it if Les Secrets had been given a different color wig, a lot of the recent releases have had the blonde hair/blue eye combination it’s admittedly a good combination but variety is the spice of life. I would have loved to have seen her as a redhead or maybe even with pale pink so her hair would look almost candy-colored (or go really wild and do alternating red and white curls so she looks like a peppermint). 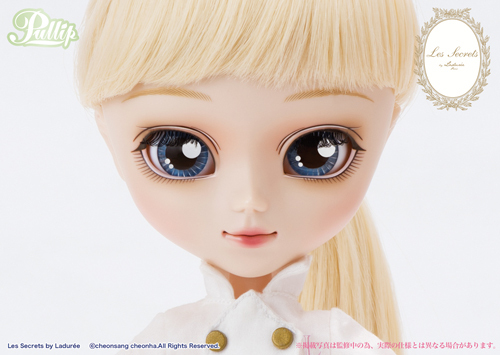 She has a really nice face up but I feel like it is recycled and has borrowed elements from a few different releases (like veryBerryPOP), I don’t think the blonde hair has helped in this regard as there are so many similar dolls to compare her to. 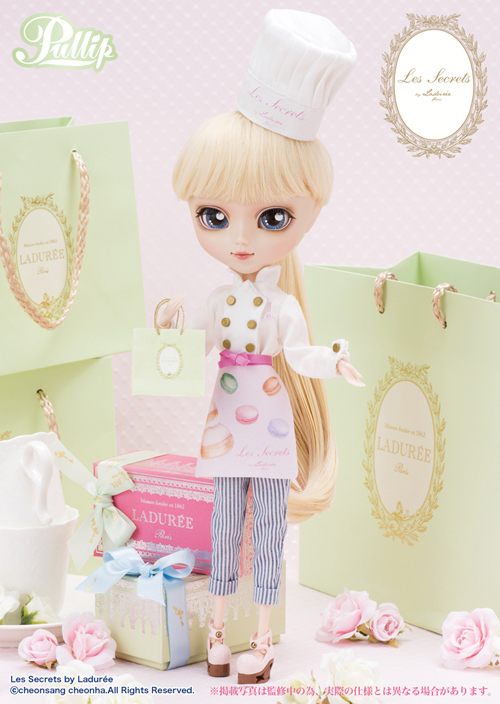 So what do you think is Pullip Les Secrets by Ladurée a sweet treat or are you on a diet? I think she is a sweet idea but I’m a bit torn on that not so sweet price, time will tell if I cave into this cutie pie or not. This entry was posted in Doll, Pullip and tagged 2018 groove, 2018 pullip, asian fashion doll, fashion doll, Ladurée, Pullip, Pullip Les Secrets by Ladurée. Bookmark the permalink.